NOTE: THIS RESTAURANT HAS CLOSED AS OF SEPTEMBER 30, 2015. The Fish House restaurant is an upscale restaurant in Stanley Park that serves westcoat cuisine with lots of fish and seafood on the menu. It is a beautiful old building. The location is close to English Bay, Ceperley Park, and the Stanley Park Pitch and Putt Golf course. IMPORTANT NEWS: The operators of the Fish House restaurant recently announced that they will not be renewing the lease on the restaurant so it will be closing at the end of the day on September 30, 2015. No word yet from the Vancouver Parks Board on who the new operator will be. MORE NEWS: A new operator has been selected by the Parks Board to operate the Fish House. No details yet as to when it will reopen. PARKING: There is a small parking lot right behind the restaurant. There is additional parking a short distance away closer to Second Beach. The best way to drive to the restaurant is to enter via the Beach Avenue entrance. Note that all parking in Stanley Park is pay parking! The restaurant was originally known as the Sports Pavilion then as the Third Beach Tea House in 1949, then the Beach House in 1974, then finally, the Fish House in 1991. Where is Fish House Restaurant (CLOSED) in Stanley Park? 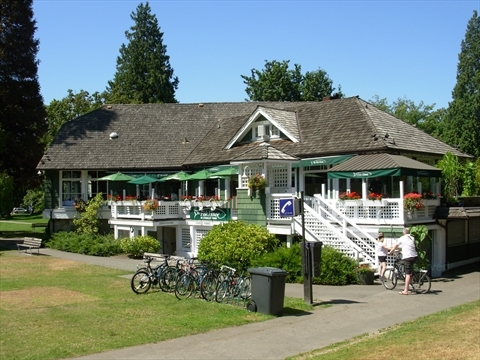 The Fish House restaurant is located just inside Stanley Park from the Beach Avenue entrance. Next to it is the Stanley Park Pitch and Putt Golf Course, Stanley Park Putting Green, and English Bay Tennis Courts.